Simon Green (born 30 March 1976), known by his stage name Bonobo, is a British musician, producer and DJ based in Los Angeles. He debuted with a trip hop aesthetic, and has since explored more upbeat approaches as well as jazz and world music influences. His tranquil electronic sound incorporates the use of organic instrumentation, and is recreated by a full band in live performances. Green's work has attained a cult following, and he has collaborated with a variety of other artists. Green debuted in 1999 on the Tru Thoughts compilation When Shapes Join Together. His stage name Bonobo, is a reference to the Bonobo chimpanzee species. Following the releases of the EP Scuba and the single "Terrapin", Bonobo was offered label deals with XL recordings and Mute records, but he chose to remain in Tru Thoughts. His first album Animal Magic was released on the same label in 2000. It received mixed reviews; Pitchfork stated that despite not being a ground-breaking chill-out album, Bonobo "[showcases] smooth breakbeat loops, synth sounds, and aforementioned dub effects. [And his] electronic music draws on live playing," according to PopMatters. Reviewer Dean Carlson also said that the album "slowly takes shape as a solid debut of narcoleptic downtempo." In spite of reactions, Animal Magic has given Bonobo a cult following. Its accompanying compilation album titled "One Offs...", was issued in 2002 and contains reworked songs and rarities. In 2001, Bonobo was signed to Coldcut's label Ninja Tune and in 2003, he released Dial 'M' for Monkey. John Bush of Allmusic stated in a review that Bonobo's influences were drawn more towards alternative rock and world music rather than hip-hop or trip hop. The album tracks "Pick up" and "Flutter" were featured in the snowboarding game SSX on Tour. In 2005, Bonobo contributed to the Solid Steel series, with It Came from the Sea. The mix features several exclusive tracks as well as remixes and re-edits. His third album, entitled Days to Come, was released on 2 October 2006. An AllMusic review states that "[Bonobo] breathes new life into a well-worn genre." With the album as well as his future work, he featured vocalists such as Bajka, thus "adding [an] organic and vibrant musicality that's rare in electronic music." Days to Come was voted Best Album of 2006 by Gilles Peterson's listeners. The song "Nightlite" appeared on UEFA Champions League 2006–2007, and "Recurring" was used in a surfing film broadcast on Fuel TV. The song "The Keeper" featuring vocals by Andreya Triana was released in September 2009 as the lead single from his fourth album Black Sands, released in March 2010. A BBC review by Paul Clarke stated that "Green has progressed from predominantly sample-based production to more live instrumentation [and] has become equally adept at mastering [...] multi-layered atmospheres." in the same review, Clarke has also commented that the songs "We Could Forever" "saddles an Afro-inflected guitar and skittish flute to deep sub-bass" and "Kiara" combines "oriental strings with cut-up beats." After their collaboration for Black Sands, Green produced Andreya Triana's debut album Lost Where I Belong. The song "Kong" was used during a scene in an artist's studio in the eighth episode of the second season of House of Cards. In February 2012, Black Sands Remixed was released on Ninja Tune, featuring tracks from the original Black Sands record remixed by electronic producers such as Machinedrum, Lapalux, Floating Points and Mark Pritchard. The first single off the next Bonobo album, "Cirrus", was given its worldwide debut on Gilles Peterson's BBC Radio 6 programme on 19 January 2013. The album is titled The North Borders and was set for release on 1 April 2013, but was released early in its digital format after a promotional copy was leaked prior to the planned launch date. The North Borders marked his first UK and US album chart entries, where they respectively reached numbers 34 and 122. The track "Cirrus" was featured as the closing song of the pilot episode for the AMC show Halt and Catch Fire. He produced the song, "Pulls" by DELS for his 2014 album Petals Have Fallen, which was released under Big Dada; a sister label of Ninja Tune. Bonobo released his sixth album, Migration, in January 2017. 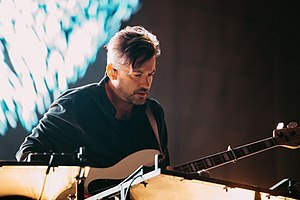 In an interview with Billboard, Bonobo said that he conceived the album from "living and being in various locations", as he toured extensively and did not "have a home base for about a year". The album and the track Bambro Koyo Ganda have been nominated for the 60th Annual Grammy Awards for Best Dance Recording and Best Dance/Electronic Album. The album peaked higher in the UK chart (number 5) and in the US (number 59). In 2018, Bonobo's "Migration" album also won Album of the Year at the 2017 Electronic Music Awards and Bonobo was also nominated for Live Act of the Year. Bonobo's sound is oriented on beats and samples but typically "soothing", combining influences ranging from club music to world music. Pitchfork named him a key figure in the 2000s downtempo electronica scene while The Guardian associated him with the recent popularity of "ambient world electronica". While his earliest work was firmly based in trip hop, his style soon became more upbeat and delved into genres such as jazz (which has led him to be described as a nu jazz artist) and traditional Indian music. He has collaborated with various artists, including Bajka, Andreya Triana, Erykah Badu, and Rhye who contributed vocals to songs on his last four albums Days to Come, Black Sands, The North Borders, and Migration, respectively. He also performed with Robert Luis of the Tru Thoughts label under the alias of Nirobi and Barakas. Whilst often touring solo, and performing DJ sets and residencies, in 2010 Bonobo opted to start touring with a full band for the Black Sands tour. The band plays live renditions of studio material, with a singer, keyboardist, guitarist, saxophonist, string section, electronics, and drummer, often with improvisations and solos. His albums employ sampling, for example 'Behind the Light' (from Pick Up EP, 2003) uses a clip of 'Judy' from John Renbourn. ^ a b c d Carlson, Dean. "Bonobo | Biography". AllMusic. Retrieved 27 February 2018. ^ "When Shapes Join Together 1 (by Various), Tru Thoughts releases". Tru Thoughts. Retrieved 3 May 2013. ^ Hughes, Tim (3 August 2017). "No monkeying around: Bonobo swings into Wilderness". Oxford Mail. Retrieved 23 December 2018. ^ "Tru Thoughts". Tru Thoughts. 28 April 2013. Retrieved 3 May 2013. ^ "Bonobo: Animal Magic Album Review". Pitchfork. Retrieved 27 February 2018. ^ "Bonobo: Animal Magic". PopMatters. 12 November 2001. Retrieved 27 February 2018. ^ "Animal Magic - Bonobo | Songs, Reviews, Credits". AllMusic. Retrieved 27 February 2018. ^ "Complete Guide: Bonobo". Clash Magazine. Retrieved 27 February 2018. ^ "Dial "M" for Monkey - Bonobo | Songs, Reviews, Credits | AllMusic". AllMusic. Retrieved 26 February 2018. ^ "SSX on Tour Soundtrack Announced – Xbox". News.teamxbox.com. 12 September 2005. Archived from the original on 10 November 2013. Retrieved 3 May 2013. ^ "Days to Come - Bonobo | Songs, Reviews, Credits | AllMusic". AllMusic. Retrieved 27 February 2018. ^ "Myspace". myspace.cn. Archived from the original on 7 July 2011. Retrieved 3 May 2013. ^ "UEFA Champions League 2006–2007 Soundtrack". IGN. 2 March 2007. Archived from the original on 20 July 2011. Retrieved 3 May 2013. ^ "The Most UFC, Motocross, Surfing, and Snowboarding on Television". Fuel TV. Retrieved 3 May 2013. ^ "Bonobo releases: Black Sands". bonobomusic. Archived from the original on 11 September 2011. ^ Clarke, Paul. "BBC - Music - Review of Bonobo - Black Sands". Retrieved 27 February 2018. ^ "Lost Where I Belong - Andreya Triana | Credits | AllMusic". AllMusic. Retrieved 27 February 2018. ^ "Bonobo 'Kong' used in House of Cards s02e08". Just Isn't Music / Ninja Tune. 10 March 2014. Archived from the original on 10 March 2015. Retrieved 27 February 2018. ^ "Statement on 'The North Borders' Early Digital Release". Ninja Tune. Retrieved 23 March 2013. ^ Perkins, Dennis. "Halt And Catch Fire: "I/O"". TV Club. Retrieved 27 February 2018. ^ "DELS - Petals Have Fallen | Albums | musicOMH". musicOMH. 9 November 2014. Retrieved 18 April 2018. ^ "Bonobo Announces New Album "Migration", Shares Video for New Song "Kerala"". Pitchfork. Retrieved 9 December 2016. ^ Klock, Jayme (12 April 2017). "Bonobo Talks 'Visual' New Tour, Creating His 'Migration' Album & More". Billboard. Retrieved 12 November 2018. ^ "2018 GRAMMY Awards: Complete Winners List". The Recording Academy. Retrieved 2 February 2018. ^ "Album of the Year - Bonobo, Rufus du Sol, Eric Prydz & More Win 2017 Electronic Music Awards". The Hollywood Reporter. Retrieved 28 May 2018. ^ a b Jones, Richard (12 January 2017). "Complete Guide: Bonobo". Clash. Retrieved 4 December 2017. ^ Saxelby, Ruth (12 April 2013). "Bonobo: The North Borders". Pitchfork. Retrieved 4 December 2017. ^ Gibsone, Harriet (12 January 2017). "Bonobo: Migration review – pensive ambient electronica from a nomadic soul". The Guardian. Retrieved 4 December 2017. ^ "Pop & Rock Listings for June 10-16". The New York Times. 9 June 2016. Retrieved 18 April 2018. ^ "Barakas". Tru Thoughts Artists. Retrieved 10 June 2008. ^ Ranta, Alan. "Bonobo / Brasstronaut – Commodore Ballroom, Vancouver BC June 30 • Concert Reviews •". Exclaim.ca. Archived from the original on 27 February 2018. Retrieved 3 May 2013. ^ "BONOBO | full Official Chart History". Official Charts Company. Retrieved 18 April 2018. ^ "ULTRATOP BELGIAN CHARTS". Ultratop. ^ "ULTRATOP BELGIAN CHARTS". Ultratop. Retrieved 13 November 2018. ^ "Bonobo discography". lescharts.com. Hung Medien. Retrieved 26 April 2013. ^ "Dutch Charts". MegaCharts. Retrieved 13 November 2018. ^ "Die Offizielle Schweizer". Swiss Hitparade. Retrieved 13 November 2018. ^ "Bonobo". Billboard. Retrieved 18 April 2018. ^ a b "BRIT Certified - bpi" (To access, enter the search parameter "Bonobo"). British Phonographic Industry. Retrieved 22 March 2019. ^ Bein, Kat (25 January 2019). "Bonobo sets a tropical mood on 'Ibrik': Listen". Billboard. Archived from the original on 30 January 2019. Retrieved 2 February 2019. Wikimedia Commons has media related to Bonobo. This page was last edited on 13 April 2019, at 14:43 (UTC).